If you’ve visited anywhere in Latin America, then no doubt you would have swayed and toe-tapped to the rhythms of the clave or shaken your hips to the inviting sounds of the timbao and felt the weight of your feel float away as you lose yourself to the music. But it doesn’t take a a trip abroad to fall in love with Latin dance, and I first fell in love with Salsa in my hometown of Brisbane, Australia, where a thriving Latin dance scene has grown. I love all types of Latin music but there is just something about Salsa that gets my heart racing. It’s the music, the tiny steps and small movements, the fast feet and proud leg flicks, the smiles the dancers beam when that link between music and heart forms and you don’t have to think about where your feet are going: the music pulls you. I’ve been dancing Salsa for many years, just for fun, social dancing, you know, but I was recently invited along to a Latin Dance Bootcamp by Mivida Wellness and realised that when you learn Salsa you end up falling in love and if you’re lucky enough to have a great teacher, like Jo, you understand that the most important thing is to stop thinking and start feeling. And that’s when the Salsa addiction hits. Here are the seven stages of a Salsa addict. Can you see the signs? You might have a partner from a Latin American country and fall in love with the music through them, or you might find yourself listening to some rhythms at a bar or restaurant and find yourself hooked to the rhythms. Whatever the case, it’s always the love of the music that lures people in to the dance. Hopefully you’ll have some brave friends with you, but a good social night of dancing will get you in the mood to move, that’s for sure. If you’re lucky, someone might just offer to teach you out on the dance floor. The spins, the turns, the dips. How the heck do all the fancy couples on the dance floor manage to do that without hurting themselves and other people? You’ll wonder if you’ll ever be able to shimmy with the best of them and every time someone asks you to dance you’ll probably warn them that you have two left feet, just to lower their expectations. It might take a dance course or a trip abroad, but eventually the dance, the rhythms, the beats, they will all make sense. Just like learning a new language, you’ll eventually begin using the language of dance without even thinking about it, and that’s when things get dangerous. Believe me, Salsa is an obsession. You’ll be eager to get out and dance at any chance possible. Thursday night Salsa at the club, done. Friday night Salsa in the city, sure. Salsa on a Tuesday night, ok, sure. Salsa on your next camping trip, sure, why not? You spend so much of the time in dance circles that before too long most of your friends will be people you know from Salsa classes and workshops or on social dance nights. Your other friends just can’t dance! How else can you get your Salsa fix? Actually, the only shoes you wear out are Salsa shoes. Eventually, after all the time you’ve been investing into Salsa, perfecting your turns and dips and allowing yourself to let go, you’ll get to a point when you think: Hey! I’m ready to perform! And, hey, go for it! Show the rest of the world your fiercest Salsa pout! 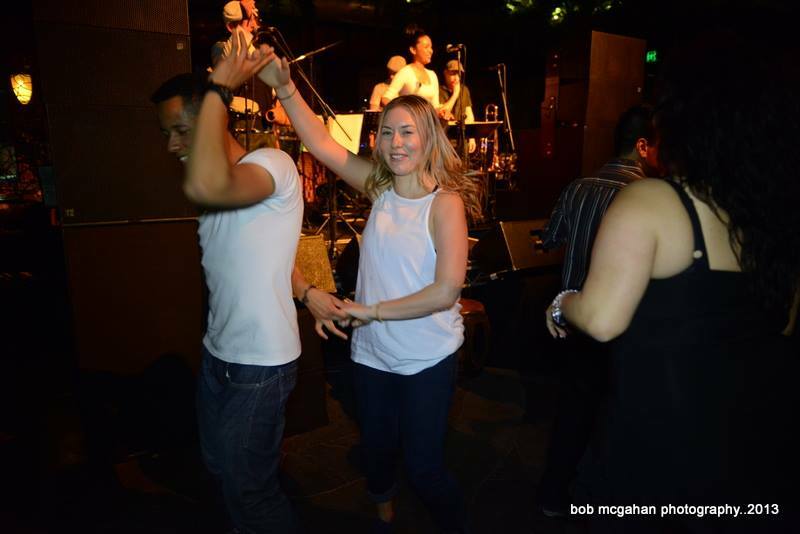 If you love dance as much as I do, and want to further your Salsa addiction, why not head along to Jo Anne’s Latin Dance Bootcamp courses in Brisbane. She’ll have you hip shaking and shimmying with the best of them in no time. Are you addicted to Salsa, too? Tell me all about your obsession! I just wish they had salsa clubs here now. I need to go back to LatAm. I’d say that’s the best way to learn, Ceri: Getting the locals to show us how it’s done! Are there no salsa nights in your part of the world? Oh no! Well an impromptu salsa party at home sounds like a great plan! I had a close salsa-loving friend in a similar situation a couple of years ago. He made sure he made a trip to Seoul every other weekend to get his salsa fix. Hah!